Eye lesions represent loss of integrity of certain eye structures and their layers. They can be sometimes fatal and result in loss of vision. Even though it is estimated that approximately 80-85% eye lesions are actually benign, the rest of them can be associated with serious medical problems. This is the reason why any new lesion on the eye, any change in color or shape must be reported and one should be thoroughly examined. Why do Eye Lesions Occur? There are many reasons behind eye lesions. Most of them can be easily brought under control with antibiotics or some other eye drops or creams, warm compresses and surgery. Certain lesions are closely associated with irritation, while others may be induced by exposure to harmful UVA and UVB sun rays. It is also possibly to end up with an eye lesion after exposure to some pathogen. All in all, waiting for too long and letting the lesion spread and enlarge is not a wise thing to do, so do visit your doctor as soon as you notice anything strange about your eyes. A nevus is a benign eye lesion which can also be found anywhere else in the body. 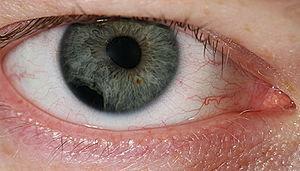 If affecting the eye nevus can or does not have to be pigmented. This is a congenital lesion often considered harmless. However, if a nevus changes its color, starts to grow etc. this is a reason for one to consult his/her doctor. Many viruses can cause inflammation of the eye and eye lesions. Herpes simplex virus type 1, for instance, predominantly affects the cornea and leads to formation of superficial or deeper corneal lesions (ulcers). Furthermore, there is a condition known as Molluscum Contagiosum. It basically affects immunocompromised individuals and develop in a form of a waxy nodule. The lesion will not withdraw on its own and is removed with cryotherapy. Actinic keratosis is a pre-cancerous lesion affecting different parts of the body and may be also develop on the eyelids. This growth resembles a horn and is flaky and basically white. It develops as a result of too much exposure to UV light. Actinic keratosis requires surgical excision because if left untreated, it eventually progresses into squamous cell carcinoma. Seborrheic keratosis is a benign lesions affecting the eyelid. It does not disturb the affected individual and may be, if necessary, surgically removed. Hydrocystoma is a lesion associated with a blockage of sweat glands. It is also removed surgically (excision). Malignant lesions, on the other hand, require more complex approach and treatment. The eye area may be affected by three malignant tumors, squamous cell carcinoma, basal cell carcinoma and melanoma. Squamous cell carcinoma is rather aggressive and develops in a form of raised, scaly lesion usually on the upper lid. Basal cell carcinoma is also a malignant tumor, but it progresses very slowly. Surgical treatment deals with the tumor and provides with complete eradication of the disease. Malignant melanoma is one of the most aggressive tumors and even in early stage it can give satellite metastases in the surrounding tissue. Finally, the eyelids may be affected by one more malignant tumor called sebaceous carcinoma. This is an aggressive tumor which, if left untreated, may easily spread to distant organs such as the lungs, liver and bones. What is causing squamous cell carc? Warning signs of skin cancer - what does skin cancer look like ?